Long have my literate friends urged me to delve into the seedy neon realm of America's master of the two-fisted crime story, Raymond Chandler and Dashiell Hammett. When these two collections went on sale a couple of months ago, I eagerly snapped them up. Now they await my pleasure. But where to begin? I started with The Maltese Falcon. But only because I knew it was a movie that had done well. 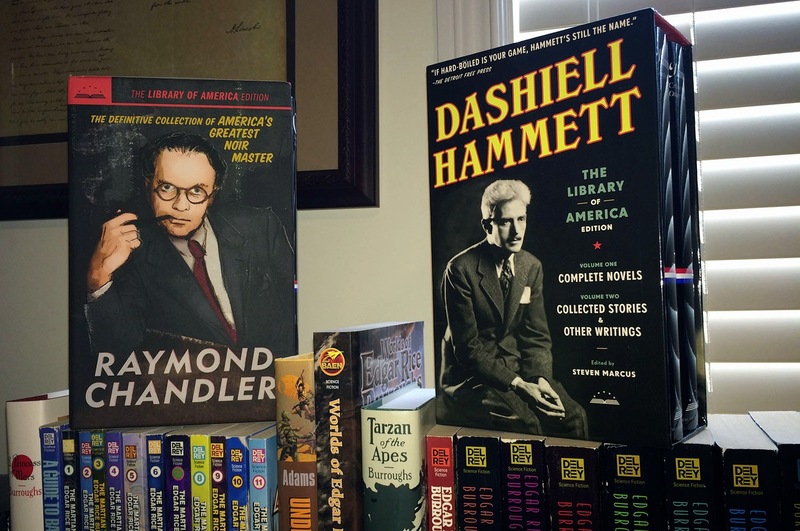 If you want to see the evolution of the genre, you start with Hammett and then Chandler. Chandler's the better wordsmith, though, so if you want something that will colour the way you write, read him first. However, I think you should read both the way you'd shuffle a deck of cards. Read one word of Hammett first, close that book, open Chandler, and read one word. Close Chandler, read one word of Hammett. That way, you'll get the most out of both. Really, though, these two authors are like your hands. Maybe you rely on one more than the other, but you don't want to ignore either of them. Those collections look magnificent. It's hard to find Hammett's short stories in a decent book - I'm certain you'll be impressed. Where did you get them?